If it's possible, this was even better than the first one!!! I hate that I have to wait for the third, but I know how it goes. I must say that I am a little bit in love with Thad. He is more the type I see Erin with. I can't wait for more. Thank you for writing such an amazing series!!!! Erin's unexpected arrival has put a damper on Angie's love life. Granted, she and Blaze haven't been together for quite some time, but she can't deny she cares for him, none-the-less. She knows Erin is the one the prophecies have spoken about for centuries, and that her relationship with her beloved isn't what she thinks it is.However, she can't quite seem to set aside the jealousy that boils to the surface every time she sees Blaze and Erin together. Angie knows Erin isn't a true threat. Yet she can't find it within herself to befriend the beautiful Nephilim. Nor can she find it within herself to accept the love Blaze wishes to share with her for the rest of his life.There's something roiling deep within her. Something she can't explain. The alien feeling is doing its best to consume her, even though she's doing her best to ignore it. Her unexpected rages and the incessant restlessness are a cause for alarm. She knows she's needs to come clean about what she's been experiencing as of late, but the fear of rejection is far too strong. Most especially when she can sense that not everyone is what they seem to be with her.Vowing to set aside her differences with Erin for the sake of the task at hand, Angie soon has a hard time making sense of what's going on. The voices in her head are getting stronger, and her actions don't seem to be her own at all. Something, or someone, is pulling her along, and she's not sure as to what to make of it. The question is, can she succeed in overcoming the darkness that threatens to consume her from deep within? Or will she allow it to claim here, once and for all?This is definitely another lovely addition to The Chosen series. I enjoyed this second book, and was delighted to see that Blaze and Angie did get a little closer. Granted, love triangle and the ending were a little unexpected. While this book also ends on a little cliffhanger, it does tie up some loose ends that book one left behind. Definitely looking forward to what book three has to bring. 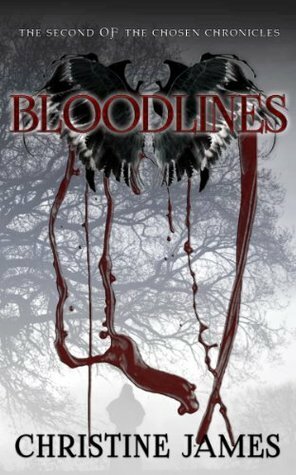 Bloodlines is the second book in The Chosen Chronicles by author Christine James. One does not need to read Risen, the first book, but it will help you to know the characters and there relationship to one another. There are some new characters in the mix. Two of which are demons and one is the 3rd making up the love triangle with Erin and Angelo. Blaze still wants Angie for a mate. More archangels are revealed as well as more secrets. This book is full of new friendships, breaking hearts and revelations. it is also full of trusts, lies and betrayals. The book really delves more into the world of nephilims, demons and archangels. There are so many twists and turns it really makes you want to keep reading. The book ends with the type of cliffhanger that makes you want to jump into the next on right away. I really loved this one more than the first. The second book in the Chosen Chronicles. Christine weaves the story even deeper. This book was such a page turner I couldn't put it down. The development of the characters, the twists and turns, and the cliffhanger! So good (you get so many emotions with this book!) . I love the mythology of this series. I cannot wait to read the third. Great book. Loved, Loved, Loved it!!!!!!!!! This series is definitely one of my top favorites. Cannot wait to see what happens in the next book! Ahhhh!